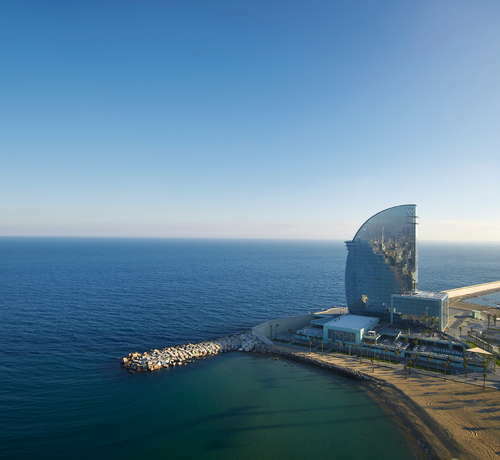 You’d be hard-pressed to find a more spectacular hotel in Barcelona, as this incarnation of the W (the flagship of the brand) has so much going on, you might just miss out on the rest of the city because of it. There are multiple pools, a one-of-a-kind spa, an enormous gym, private beach access, and loads of dining and drinking outlets. Fun, flirty, and full of life, this hotel is filled with excitement every day of the week. The hotel is now a Marriott rewards member, so if you have a LOT of points, you can use them here. Like every W hotel, the rooms are separated into groups like Wow, Cozy, Wonderful, and Fabulous, etc. 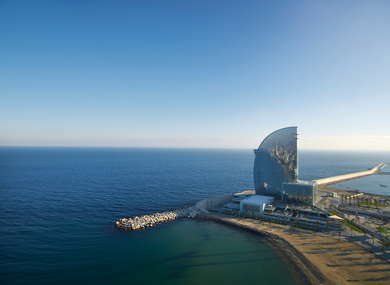 Whatever you do, request a room on the higher floors (there are 26 total) as the picturesque views of the beach and city are unlike any other hotel in Barcelona. In all rooms, beds act like front row seats to majestic window vistas outside. All come with free bottled water, Bose Bluetooth speakers, Nespresso coffee makers, and lots of design touches. Neon white lights line the walls and special pillows with artistically interpreted visages of famous disruptors like Gaudí and Dalí lay atop the beds. Other touches include USB ports bedside, cushy couches, and chairs by the window, and a mix-bar where you can create your own cocktail concoctions. The open room concept extends to the bathrooms which have black slate floors and walls, large rain-showers (optimal for more than one person at a time), lit shaving mirrors and uber-soft slippers and robes. Bath products are by Bliss (as in all W properties) and also used in the hotel spa. As you enter, you’ll be wowed by natural light pouring in from the atrium 25 floors above. Black leather couches and black hanging basket chairs are for guests waiting to check in or out, and a curated store operated by La Commercial (known for chic fashion – bags, sunnies, dresses) sits in the back. The expansive lobby (dubbed the Living Room) opens up to multiple bars, lounges, and restaurants that all lead to the pool deck outside in the back of the hotel. There are actually two outdoor pools here that unfortunately close down in cold winter months. But you’ll want to come in the summer as you soak in the beachfront from first-come-first-serve cabanas and/or white cushioned loungers surrounding the space. The Wet Deck is the main pool that has a lively bar scene and a summer series with DJ-led parties on Sundays from 7 pm to midnight. The second pool called the Sun Deck is more chill as a laid-back vibe permeates the space while swimmers sip on cold cocktails while watching the surfers below. Bliss Spa is one of the most decadent spots in the city. Here, eight treatment rooms are set up for every kind of massage imaginable and there are spaces for nails, facials, body wraps, and more. Once you’re done with your treatment, escape to Getaway, the hotel’s new relaxation area with a giant indoor swimming space, Jacuzzi, and steam and sauna rooms. Open 24-hours, the extra large gym features all the latest in workout technology with loads of free weights, TechnoGym machines, and a heavy bag atop white-wood floors. There’s complimentary yoga and Pilates on the beach or on Thursdays there’s Urban Gorillas outside the gym which is a free Cross-Fit like workout where only the strong survive. There’s no shortage of eating options at the hotel. The main restaurant is off the lobby called Wave and serves up Mediterranean treats for lunch and dinner. It’s also the breakfast area which has a wide range of options including an entire bottled juice section to help you hydrate from the night before. Other outlets include Bravo24 for seafood lovers, Salt the beachside spot for burgers and booze, and Eclipse, the top floor restaurant and bar with Asian fusion cuisine. You’ll never be parched at this hotel. The W Lounge in the lobby is a swanky spot with loads of cushy couches for late night snuggling. On the roof at Eclipse, you’ll get million-dollar views to go with specialty cocktails. The Wet Bar at the pool never has a dull moment. And in the summer, Salt becomes a beach club on select nights with DJs spinning Fridays, Saturdays, and Sundays. Look inside your room key sleeve - you might just find a coupon for a free "crack baby" shot at Eclipse. Bottoms up! If there’s a downside to staying at the W, its location is pretty far from most major attractions, restaurants, bars, and more in the city. You’re literally at the end of a peninsula and it’s a good 20-minute walk to the edge of town and the closest metro stop. But as stated in the introduction, you might not want to ever leave because the property is incredible, and the beach is breathtaking. There are taxis waiting in front at all times and there is on-site parking if you rent a car. Blue Spot (1-minute walk) is just below the hotel and serves some of the freshest seafood in town. If you’re looking for Michelin-level tapas, head into town and stop at Ten’s Tapas Restaurant (25-minute walk) where starred chef Jordi Cruz whips up fried goodies gourmet-style. In all honesty, the bars at the W are worth staying for, but if you happen to come in winter months, you might want to venture into the city. All the biggest clubs in Barcelona are down at the other end of the beach where you’ll find Opium, Shôko, and others (25-minute walk). The W Barcelona is a fully contained resort with its own private beach, tons of food and drink options, two pools, an amazing spa, and a great gym. The rooms have endless views with lots of nice amenities, and the level of service is as sky high as the building. If there’s any drawback it’s that you’re not right in the city (but maybe that’s the point) and the hotel doesn’t provide a free shuttle to get you back and forth. That aside, you may not want to leave as the hotel blankets you in the best that Barcelona hospitality has to offer.